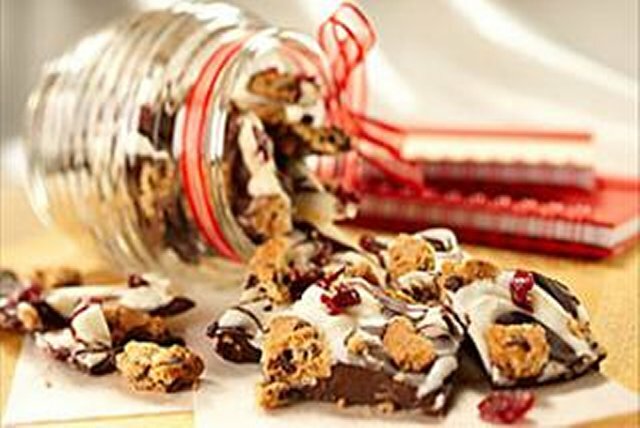 Mixed chocolate bark is always a welcome gift! This recipe takes the classic one step further by adding broken bits of chocolate chip cookies. Toast 1/4 cup PLANTERS Slivered Almonds. Add 1 Tbsp. nuts to melted chocolate in each bowl before dropping onto baking sheet and swirling as directed. Sprinkle with remaining nuts, cookies and cranberries.